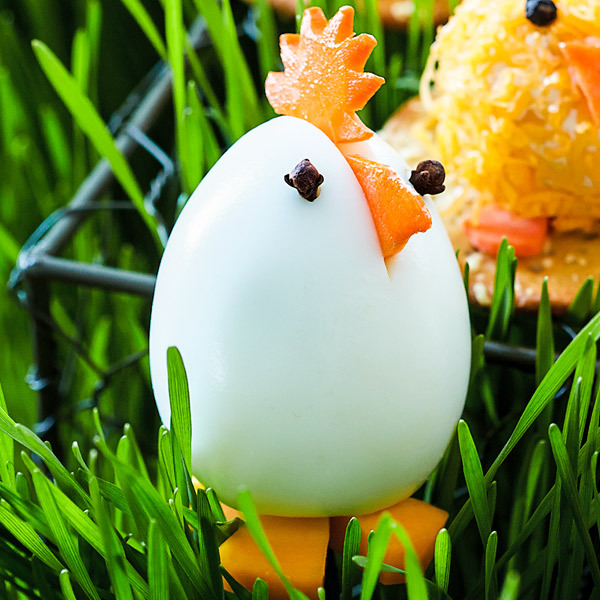 Everyone will cluck in admiration at these cute Easter appetizers (and they’re a great use of all those boiled eggs you might happen to have lying around this time of year!). Cheddar cheese, carrot rounds and whole cloves transform plain hard-boiled eggs into cute hens ready to strut their stuff on your Easter buffet table. This oh-so-easy (and adorable!) hard-boiled egg recipe also makes a fun Easter breakfast or brunch idea your kids will love. Place eggs in a single layer in saucepan. Cover eggs with cold water by 1 inch. Slowly bring water to a boil over medium heat. Once water has reached a boil, cover and remove from heat. Let eggs sit in the covered saucepan for 10 to 12 minutes. Place eggs in a colander or leave in saucepan and run cool water over them to stop the cooking process. After eggs are cool to the touch, peel. Then, make a slice across the top pointed end of each egg about a third of the way down. Cut wedges from a large, thin round slice of carrot to create the spiky comb. Slice another carrot round in half for the beak. Make 6 of each. Insert a half round of carrot into an egg at the bottom of the slice to create the beak. Next, insert the comb into the top of the slice so that at least half the comb is visible. Repeat for all the eggs. Insert 2 cloves into each egg for the eyes. For each base, slice a ¼-inch-thick round of cheddar cheese. Make 3 wedge cuts on the circle to create the feet. Place each egg on its feet. If necessary, slice off the very bottom of the eggs so they don’t topple over.